Beyond the War on Invasive Species offers a much-needed alternative perspective on invasive species and the best practices for their management based on a holistic, permaculture-inspired framework. Utilizing the latest research and thinking on the changing nature of ecological systems, Beyond the War on Invasive Species closely examines the factors that are largely missing from the common conceptions of invasive species, including how the colliding effects of climate change, habitat destruction, and changes in land use and management contribute to their proliferation. 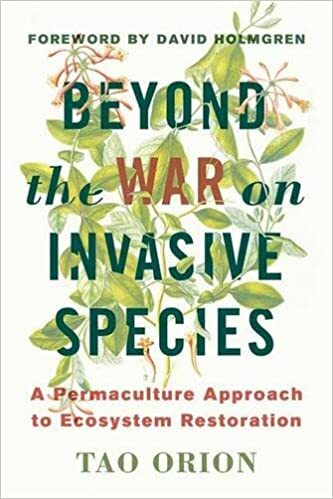 Beyond the War on Invasive Species demonstrates that there is more to the story of invasive species than is commonly conceived, and offers ways of understanding their presence and ecosystem effects in order to make more ecologically responsible choices in land restoration and biodiversity conservation that address the root of the invasion phenomenon. The choices we make on a daily basis―the ways we procure food, shelter, water, medicine, and transportation―are the major drivers of contemporary changes in ecosystem structure and function; therefore, deep and long-lasting ecological restoration outcomes will come not just from eliminating invasive species, but through conscientious redesign of these production systems.